Tieline’s Bridge-IT is the ultimate affordable, high-performance, stereo IP audio codec solution for broadcast and professional applications. Designed to deliver point-to-point or multi-point connections, Bridge-IT transports audio streams reliably, simply and effectively over a range of managed and unmanaged wired and wireless* IP data networks, such as LANs, WANs and the internet. Expand your IP network at a fraction of the cost of competing IP codecs, without compromising on quality or broadcast quality features. Multi-unicast in stereo to up to 6 different end-points from a single codec and reduce capital expenditure across your broadcast network. Now SmartStream PLUS has revolutionised IP broadcasting by delivering the rock solid and reliable STL-grade audio quality using inexpensive unmanaged IP networks like the internet for remotes and nailed up links. Some other manufacturer's charge thousands of dollars for IP managment software as if it's an optional extra. Tieline believes high performance and rock-solid reliability is an essential part of each and every broadcast and delivers its renowned SmartStream IP management software for free. Bridge-IT is IPv4/v6 and EBU N/ACIP Tech 3326 compatible over IP and will connect to any SIP-enabled IP codec brand with industry standard algorithms, as well as VoIP devices supporting G.711 and G.722. Bridge-IT is also internet/satellite streaming and HD and digital radio compatible. It is designed for desktop use or two units can be installed side-by-side in a purpose-built 1RU mounting bracket. Front panel navigation, LCD display, PPM metering and dialing key pad. The comprehensive HTML5 Toolbox web-browser GUI control interface. Broadcast XLR connectors, simultaneous analog and digital audio in/outs, plus a huge range of algorithms - including Opus as standard. IPv4/v6 and EBU N/ACIP Tech 3326 compatibility over IP and will connect to any SIP-enabled IP codec brand. Reliable automated SD card backup (since 2009), unlike some other competing products! Unlike most affordable IP audio codecs, Bridge-IT has all the broadcast connectors you would expect on a full-featured codec. Simultaneous analog and digital AES/EBU audio outputs are provided on XLR connectors and it includes a ¼” (6.35mm) stereo headphone output. Bridge-IT comes standard with 16 Bit 22kHz uncompressed linear audio, as well as Opus, MPEG Layer 2, AAC-LD, AAC-ELD, LC-AAC, HE-AAC v.1 and HE-AAC v.2, G.711, G.722 and Tieline Music and MusicPLUS. Music PLUS delivers 22 kHz mono and stereo with 20ms encode delay at under100 Kbps, offering huge savings on your IP data bills and outstanding audio quality. HE-AAC v.2 is capable of delivering high fidelity stereo IP audio at bit-rates as low as 24Kbps. Optional aptX Enhanced encoding is also available for extremely low delay connections. In case your IP link fails Bridge-IT also has an SD/SDHC card slot which can be pre-loaded with MP3 or linear backup audio for playback. Bridge-IT's onboard relay control ports can also be programmed to notify you of a failure via any third party relay-enabled hardware. * Requires 3rd party hardware to connect to wireless network. Robust DSP-based architecture designed for mission critical audio. Analog and Digital (AES3) inputs and outputs. Multi-unicast to up to 6 endpoints. Multicast to unlimited endpoints over compatible networks. Uncompressed PCM audio plus other popular algorithms as standard, including LC-AAC, HE-AAC v1 and v2, AAC-LD, AAC-ELDv1 and v2, Opus, MPEG II, MPEG Layer-3, Tieline Music and MusicPLUS, G.722 and G.711. Low-delay, cascade resiliant aptX® Enhanced* algorithm (additional purchase). Broadcast quality analog XLR inputs/outputs. Simultaneous analog and digital AES/EBU audio outputs. Automated failover to backup audio on SD card. Receive calls from codecs using Fuse-IP bonding. Configure up to 6 SIP accounts and connect up to 2 SIP interfaces. ¼” (6.35mm) stereo headphone output. 2 relay inputs and 2 opto-isolated outputs plus RS-232 for local and remote control of equipment at either end of your codec link. USB slave connection for codec configuration. 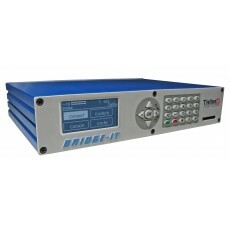 Full hardware front panel interface including navigation, LCD display, PPM metering and dialing key pad. Configurable software rules engine via web-GUI for Control Port functions, plus WheatNet-IP LIO compatibility. Upgrade firmware from an SD card. Backup and restore configuration via SD card. Contact Tieline or your favorite dealer for a quote on software feature upgrades.